Why Does My Heater Keep Shutting Down? Is Your Furnace Too Noisy? What Are the Benefits of Using a Boiler? We have reached the heating season here in Virginia. Though we don’t live in a part of the country where winters are extreme, we still face plenty of cold temperatures! If you are looking for a new heating system for your home, consider a boiler. Boilers are durable, reliable, and energy efficient. An experienced HVAC professional can help you decide if a boiler is right for your home. A boiler is considered a radiant heating system. 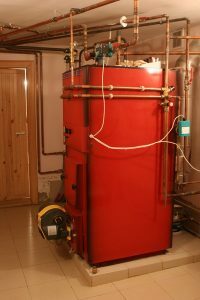 A boiler heating system is made up of two primary parts. The boiler is responsible for heating and distributing water, and the pipe network carries the heated water to various rooms in the home. The pipes are installed in the walls or underneath the floors. When the water flows through the pipes, the heat radiates into the room. Boilers have a low number of moving parts, which means less maintenance and fewer parts that will need repair. Forced-air systems have multiple motors and a blower fan in order to work, but the only major moving part on a boiler is the circulator pump. Because of this, boilers undergo less stress when they’re working. In general, it is important to schedule regular maintenance to avoid repairs. However, things inevitably happen. Thankfully, Polar Bear Air Conditioning & Heating offers boiler repair in Alexandria, VA.
Boilers use less fuel to heat your home than forced-air systems, which means lower energy costs. A new boiler can have an AFUE, or efficiency rating, well about 90%. This is important. It means that over 90% of the fuel being used by your furnace becomes heat for your home. Heating water is more efficient than heating air since air loses heat faster. Plus, a furnace has fewer moving parts. When a system does not have to work so hard to provide you with heat, it is generally more efficient. This seems like an obvious point, but what we mean is that a boiler offers a nice, even spread of heat. Sometimes the air blowing out of a forced-air system can gather at the top of a room. It can take a long time before it eventually spreads out. The radiant heat from a boiler moves evenly through a space, making for fewer cold spots and more consistent heat. Should you decide that a boiler is the right system for your home, find a professional HVAC company that can properly install and service it. It is imperative the boiler is the right size for your home and needs. If it is too big, it can heat up too quickly and begin to short cycle. It will also cost you more money. A boiler that is too small will struggle to heat your home, making it less efficient, thus costing you more. Lastly, your new boiler will slowly lose efficiency and effectiveness without proper maintenance. Polar Bear Air Conditioning & Heating can help you with all your boiler needs. Contact us today!